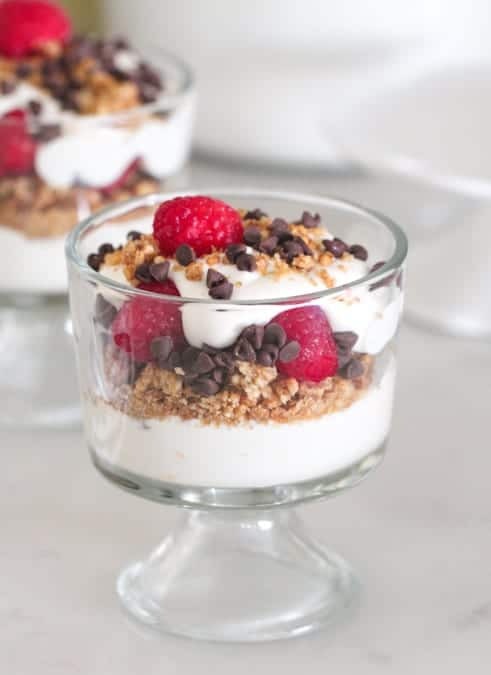 Chocolate Raspberry Yogurt Parfait for the win! Perfect for afternoon snacks or even great on a brunch menu! Layered with your favorite fruit and granola. I love making a layered yogurt parfait for the kids breakfast. Not only are they beautiful and delicious, but they take just minutes to put together! 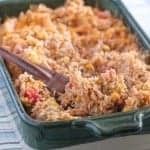 This is a great recipe to get the kids in kitchen to help. 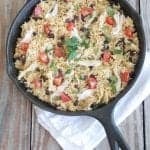 The whole family will enjoy this recipe! Try my Chocolate Peanut Butter Pie Yogurt Parfait too! 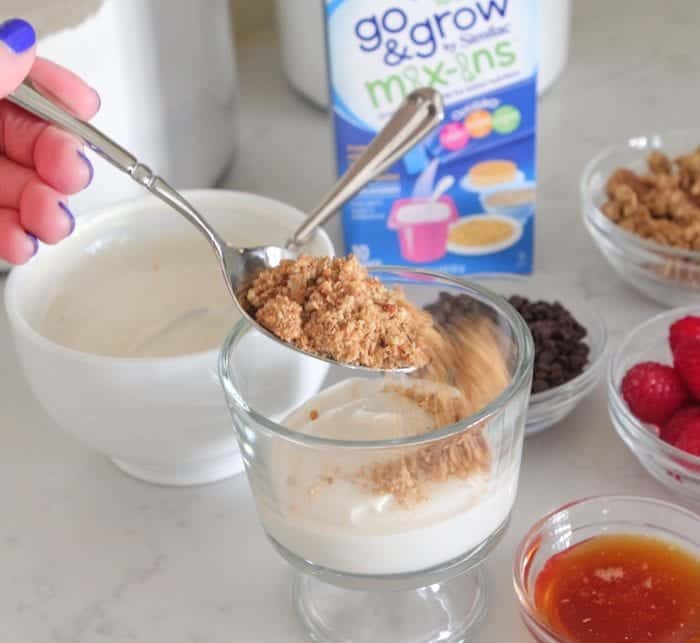 It’s always a pleasure partnering with Similac Go & Grow Mix-Ins to bring you a new recipe packed with some extra nutrition. I put together a yogurt parfait with some of my favorite flavors and ingredients that the kids love. 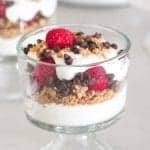 The chocolate and raspberries go so nicely together plus the granola layer adds a “pie” like crunch in every bite. 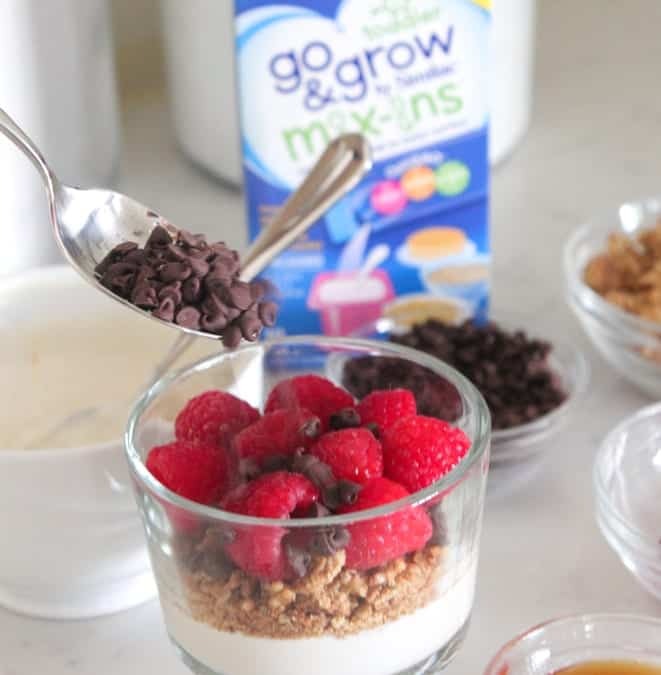 Add your Go and Grow Mix-Ins to the yogurt. Stir well. 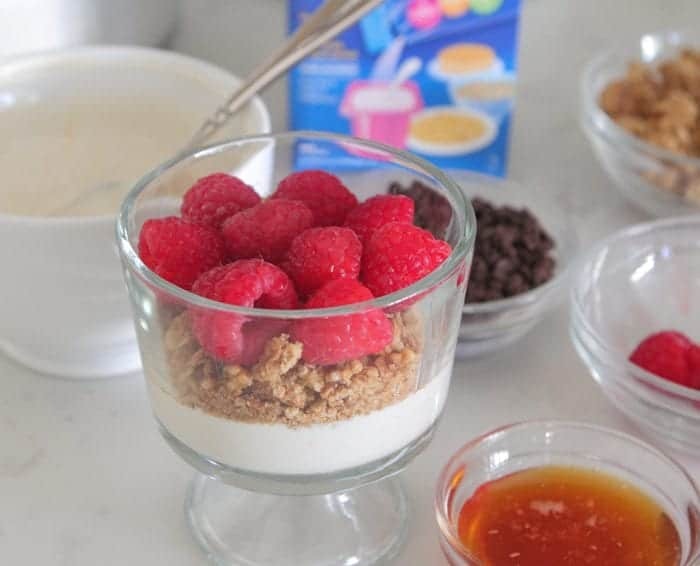 Layer the yogurt to the bottom of your parfait glasses. Layer your raspberries over the granola. Sprinkle some chocolate chips over the raspberries. Top with another spoon of yogurt, granola, a raspberry and chocolate chips. Perfect! Serve your parfaits chilled. You can refrigerate up to an hour before serving. Note that waiting to serve much longer than one hour, the granola gets soft. 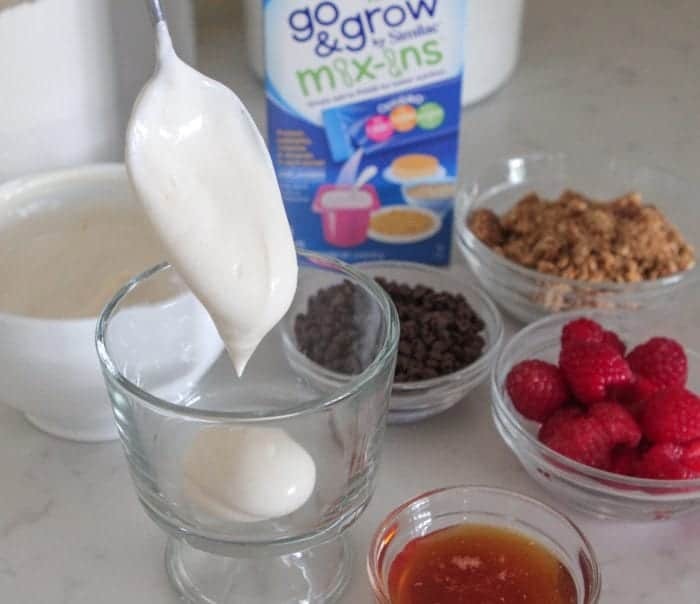 Place yogurt and Similac Go & Grow Mix-Ins into a mixing bowl (optional), stirring until well combined. Spoon a layer of yogurt into the bottom of your parfait glasses. 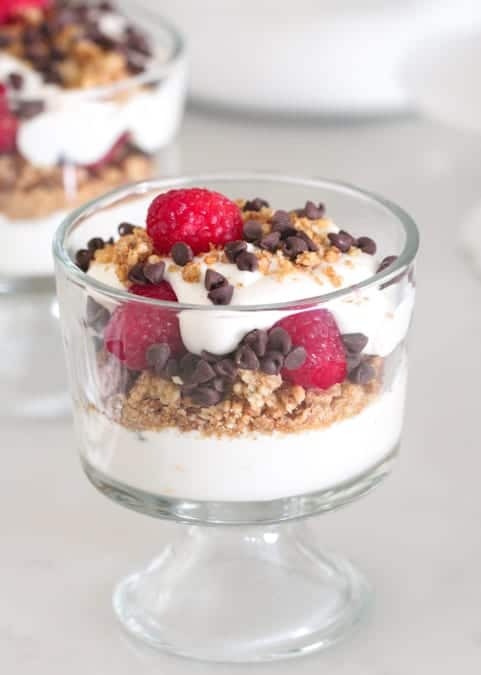 Spoon crushed granola over yogurt then top with a layer of raspberries and chocolate chips. Top with another smaller spoonful of yogurt, granola, a raspberry and chocolate chips. Served chilled. Refrigerate up to one hour before serving. Note that granola will get soft if refrigerated too long. Disclaimer: This post was in partnership with Similac Go & Grow Mix-Ins. 2016. All thoughts and opinions are 100% my own. Thank you for supporting the brands that make Picky Palate possible. I love the combination of chocolate and raspberries. 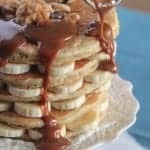 These are perfect for an easy breakfast for the kiddos or a snack. Great idea. A delicious pick me up snack!! These parfaits are perfect for fresh summer berries! How cute are these, Jenny? What a great idea!! My kids will love these! What a fun way to enjoy yogurt! Just started eating yogurt with the last year (as an adult!! ), and I’m constantly mixing in granola. 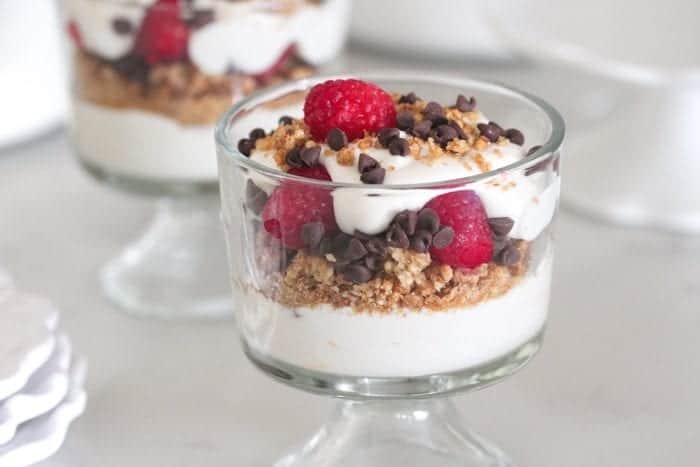 These little parfaits look like a great snack to try! These are so pretty. I’m such a fan of yogurt parfaits. I love making them because they’re quick and easy. I’m not a big morning person so I like breakfast that whips up in a snap. My boys would love assembling these!! Such gorgeous photos too! I wish I could eat this everyday for a snack! Love all the layers. I missed so many food trends, and will continue to do probably…lol! This dessert couldn’t be easier, and so good looking! Delicious idea! I love parfaits! My kids would go bonkers for these!! Your article is good and meaningful. 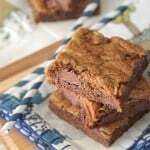 Wow that is so mouthwatering, I will try your recipe..! on. I want to encourage you continue your great writing, have a nice holiday weekend!